This type 304 stainless ½" NPT backnut features a machined recess to fit our O ring R42. 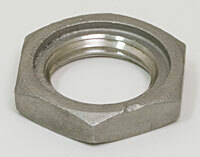 The machined recess holds the O ring in tight, preventing it from expanding when using this nut as a bulkhead nut. It can also be used inside a pot without the O ring.